FA: Bruce Brossman, Mike Breidenbach, 1985. An old-school route that manages to wind its way up the steep face left of Hobbit Book at a moderate grade, Middle Earth is a sustained, wandering climb with many heady face climbing sections. It’s easy to confuse the start of Middle Earth with an old abandoned project that starts just left of Hobbit Book in another right-leaning crack. Middle Earth starts in a fist crack near the big right-facing corner of Serrated Edge (old-school 5.10 wide), while the project starts just left of Hobbit Book and is thin hands. Starting up an awkward leaning fist crack that ends 60 feet up, it’s best to end the pitch at an awkward belay 15 feet before the end of the crack at a foothold next to the hand crack. If you set the belay at the end of the crack, you risk a Factor 2 fall on the belay (and straight onto the belayer if the leader takes the bulge on the right). The second pitch starts with the crux of the route, a 5.10 bulge with a couple different options, both of which lack protection and have a bad landing on the sloping ledge. While the route has traditionally been rated 5.10a, this bulge is pretty hard and heady for that rating, and the 1982 Alan Nelson guide to Tuolumne called it 5.10+. After pulling the bulge, a thin piton gives at least psychological pro up a slopey ramp to a bolt. A long traverse right to the dike crack gets easier the further right you move, so it isn’t bad for the leader, but the follower risks a big penji. 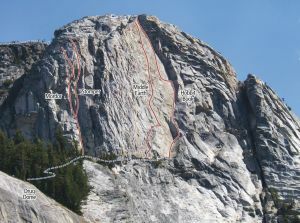 The third pitch has two hard sections, one up a featured face right of the first bolt, and the second a downward traverse to the flake from the second bolt. The flake is fairly hollow, and the thicker stronger sections of the flake should be used for protection. The fourth pitch follows a featured dike up and right with intermittent pro. Near the top, an excellent hand crack leads to a short knobby face to a small belay ledge with anchor pro in an arching undercling. Don’t continue up to the bigger ledge with a cave up and left, since the only pro is behind a large detached block. The last pitch has a couple options – follow the dike at 5.9 R/X with tiny cams and nuts as the only pro, or follow thin cracks up and right to the very top of the last pitch of Hobbit Book. Which SuperTopo guidebooks include a topo for Middle Earth?